Last week, the U.S. Environmental Protection Agency (EPA) kicked the can down the road on a key study designated to examine the connection betweenhydraulic fracturing (“fracking”) and groundwater contamination in Pavillion, Wyoming. A study originally scheduled for release in 2014 and featured in Josh Fox’s “Gasland 2,” it will not be complete until 2016 in a move that appears to be purely politically calculated by the Obama Administration, akin to the EPA’s dropped and censored groundwater contamination study in Weatherford, TX. Now, just days later, a damning study conducted by Duke University researchers published in theProceedings of the National Academy of Sciences again links shale gas fracking to groundwater contamination. The Duke researchers did so by testing samples of 141 drinking water samples of Pennsylvania’s portion of the Marcellus Shale basin. This is the Duke professor’s third study linking fracking to groundwater contamination, the source of drinking water for hundreds of thousands of citizens in the Keystone State. The industry is likely to come out with the familiar chorus that the contaminated water is “naturally occuring,” but the latest Duke study shows otherwise. Robert Jackson, a professor of environmental sciences at Duke’s Nicholas School of the Environment and one of the study’s co-authors, pointed to the the fact that some of the contaminated water samples exhibited the chemical signature of Marcellus Shale gas. The Duke study offers food-for-thought in the hours leading up to President Obama’sforthcoming announcement of a climate change legislative plan at Georgetown University, just a month after his Bureau of Land Management adopted the American Legislative Exchange Council (ALEC) model bill for fracking chemical fluid disclosure on public lands. Charlevoix, Michigan – Today the Committee to Ban Fracking in Michigan announces the first round of endorsing organizations and individuals who support the Committee’s ballot initiative to ban horizontal fracking and frack wastes in Michigan. Oakland County Water Resources Commissioner Jim Nash endorses the campaign. Nash, an outspoken critic of fracking, has been holding public forums on horizontal fracking in communities throughout Oakland County, reaching out to residents who are worried and outraged at the harm fracking will do to their communities’ quality of life and Oakland County’s water. Dr. Christopher Grobbel, of Grobbel Environmental and Planning Associates, Traverse City, is Michigan’s preeminent environmental and toxic waste clean up consultant. Grobbel has been meeting with citizen groups around the state in front-line communities about to be, or already impacted by, horizontal fracking. His hard-hitting talks and power point presentations debunk what the Department of Environmental Quality is selling to the public as “facts” and he exposes the state’s atrocious environmental clean up record. Grobbel, whose educational background is in environmental law and policy, once worked for the state’s groundwater division putting together the list of contamination sites, and is a frequent expert witness in numerous oil and gas contamination lawsuits. The Michigan Chamber of Commerce recently called the ballot initiative petition “dangerous” and labeled the Committee as “environmental extremists.” “We won’t put up with the fear-mongering and name-calling by the Michigan Chamber of Commerce describing Michigan voters who are standing up for democracy and the protection of our environment and public health from an extremely polluting, toxic industry,” stated Kozma. All ballot initiatives are non-partisan. Initiatives are an electoral process guaranteed by the Michigan state constitution. The Committee to Ban Fracking in Michigan is a ballot question committee registered with the Secretary of State Bureau of Elections. The purpose of a ballot initiative is to put a vote of the people on the ballot in a statewide election. Among the organizational endorsers are: Michigan Citizens for Water Conservation, which sued Nestle over public trust water issues and bottling water in Mecosta county;Article32.org-Idle No More (www.article32.org), a Michigan Native American grassroots group seeking to uphold the treaty rights of Native Americans to protect the environment; Gray Panthers of Washtenaw County, which works on issues of stewardship and protection of Great Lakes water resources, corporate control, and privatization; Green Party of Michigan, which champions environmental wisdom and grassroots democracy; Kalamazoo Peace Center; Crawford County Peaceseekers, a grassroots group located in the heart of fracked Michigan; Progressive Democrat Caucus of the Michigan Democratic Party; North Oakland Democratic Club; and Natural Awakenings West Michigan. Endorsements will be announced periodically. To endorse the campaign, organizations, groups and individuals are urged to go to the Committee’s website at: www.letsbanfracking.org and go to the Endorse page to register their support. Non-profits may endorse ballot initiatives because it is not considered lobbying to ask fellow voters to sign a petition or vote for a ballot proposal. Organizations and its members are expected to assist the campaign to gather signatures and and raise money to qualify for the ballot. Contributions to the campaign can be made online at www.letsbanfracking.org or by check to: Committee to Ban Fracking in Michigan, PO Box 490, Charlevoix, MI, 49720. Contributions must include: contributor’s name address, and occupation, employer name, and employer address. 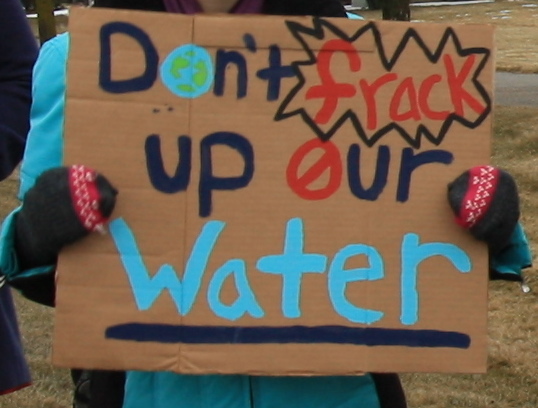 Protest sign outside Michigan Oil and Gas Association meeting in March 2012. Photo by LuAnne Kozma. Vancouver, BC – Alberta-based environmental consultant Jessica Ernst just released the first comprehensive catalogue and summary compendium of facts related to the contamination of North America’s ground water sources resulting from the oil and gas industry’s controversial practice of hydraulic fracturing (fracking). Based on research collected over many years, the 93-page report, Brief Review of Threats to Groundwater from the Oil and Gas Industry’s Methane Migration and Hydraulic Fracturing, looks to be a game-changer document, providing little ‘wriggle room’ for private industry and government spokespeople advocating fracking’s immunity from public concern, criticism and liability. southwest United States in the late 1970s, and through subsequent and evolving grandiose technical stages of widespread experimenting with fracking in the United States and Canada, the deep-pocketed inter-corporate industry has consistently fought and influenced both government and citizenry by burying the truth about its cumulative impacts to the environment and human health through confidentiality agreements, threats, half-truths, and deceptions. This catalogue, devoted primarily to the theme of groundwater impacts, helps to shine the light upon a behemoth circus of utter pitch black darkness. Vancouver, C.-B., Jessica Ernst, consultante en environnement de l’Alberta, vient de rendre public un catalogue exhaustif et un recueil sommaire de faits reliés à la pollution de sources d’eaux souterraines suite à la pratique controversée de fracturations hydrauliques effectuées par l’industrie pétrolière et gazière. En se basant sur de la recherche colligée pendant plusieurs années, le rapport de 93 pages intitulé “Brief Review of Threats to Groundwater from the Oil and Gas Industry’s Methane Migration and Hydraulic Fracturing” pourrait s’avérer être un document charnière, laissant peu de chance aux porte-paroles de l’industrie privée et des gouvernements qui veulent l’immunité de la pratique controversée vis-à-vis les préoccupations du public, les critiques, et leur responsabilité légale. Depuis les débuts des expériences de fracturations pour le gaz de houille dans le sud-est et le sud-ouest des États-Unis vers la fin des années 1970, et durant les stages techniques subséquents de l’expérimentation à grande échelle du fracking aux États-Unis et au Canada, l’industrie corporative aux poches creuses s’est entêtée et a influencé le gouvernement et les citoyens en taisant la vérité sur les impacts cumulatifs de la pratique sur l’environnement et la santé humaine grâce à des ententes de confidentialité, aux menaces, aux demi-vérités et aux impostures. Ce catalogue, qui se concentre surtout sur le thème des impacts sur les eaux souterraines, aide à jeter de la lumière sur un immense cirque d’une noirceur profonde. Mme Ernst a préparé un argumentaire solide. Sa collection fournit d’excellents outils de travail techniquement aisés à utiliser qui aidera le public à tirer ses propres conclusions de cette information essentielle. Ce n’est pas seulement un document inestimable pour les Nord-Américains, mais pour le monde entier également.